Will the official URE price for 2014 fall to 162 PLN? At the end of March each year, URE (the Polish Energy Regulatory Office), publishes an average electricity energy selling price for the previous year. This official URE price may be used be the renewable energy generators, when selling the electricity they produce in the following year (April-March) to the obliged buyers (local Distribution Network Operators or OSD). In a way they have a guaranteed energy price for a given year. While for the renewable energy generator, the official electricity price may remove one of the variables from its volatile business, it also means additional costs for the obliged network operators. For example, Energa - the OSD covering northern part of Poland where significant renewable energy sources (RES) are located, said it spent more than 100 mln PLN (23 mln EUR) on additional costs related to the energy purchases from the renewable sources. No wonder, the publication of official URE price is closely watched by both renewable energy producers and obliged network operators. The URE price is calculated using reports from the sellers of the electricity submitted to the ARE (Energy Market Agency). For collecting and analyzing the reports requires time, URE is able to announce the official electricity energy price in the previous year, at the end of the first quarter of following year. Since all the electricity needs to be traded on the Polish Power Exchange (TGE / POLPX) I was wondering whether it is possible to "predict" the official URE price using the market data. Markets for electricity are quite a complex beasts, characterized by many different segments and instruments, high volatility and in the meantime - various seasonabilities. BTW: The average electricity price was above the official URE price from 2013, used since April 1st, 2014. 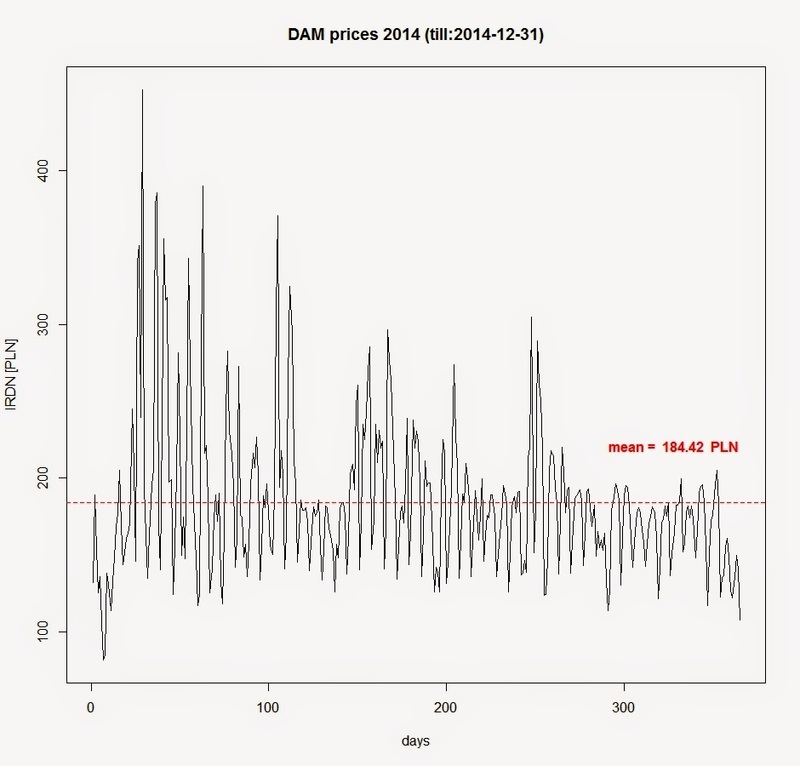 When ones calculates the prices for the three last quarters of 2014, the average DAM price is even higher - 191 PLN (44 EUR) or 5% above the official URE price. A simple model based on the market electricity prices I created at the end of 2014, gave a tight fit with the announced official URE prices for 2011, 2012 and 2013. It also delivered a little surprising "prediction" that the official URE price for 2014 may be 162 PLN (37 EUR) or -12,1% below the average DAM. We will find out whether this result is close to the actual at the end of Q1.